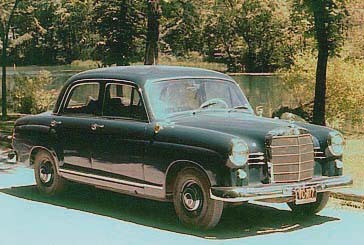 In the USA during the 1950s, Mercedes-Benz vehicles were sold through Studebaker-Packard dealerships. 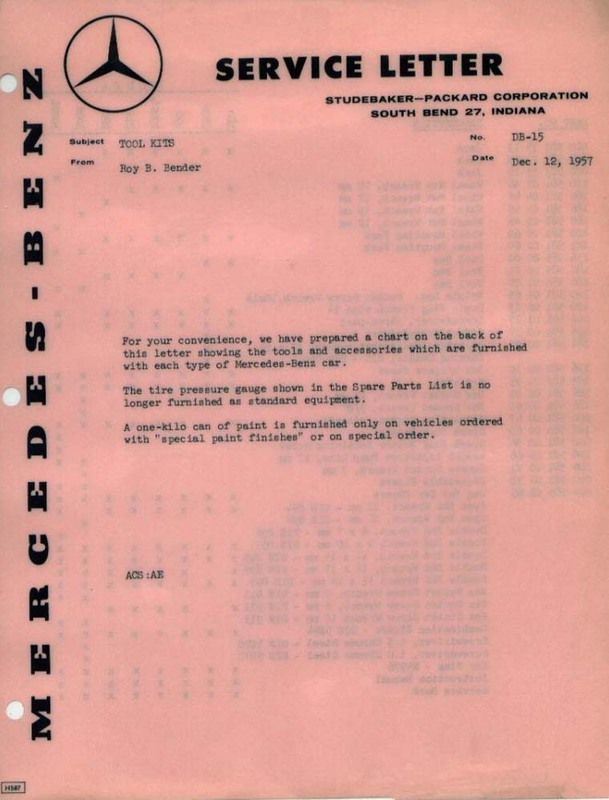 Here is a service letter from Studebaker-Packard Corporation (South Bend, Indiana) that includes a chart showing the tools and accessories that were furnished with each type of new Mercedes-Benz passenger vehicle of the period. 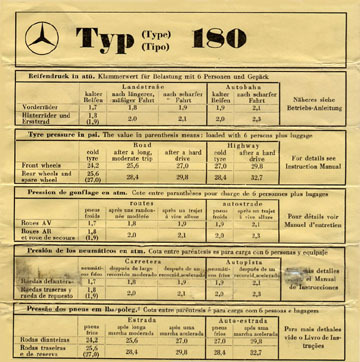 The Studebaker-Packard chart is not always consistent with the illustrated, model-specific Mercedes-Benz Ponton spare parts lists (catalogues). One such contradictory item is the U-shaped wheel mounting fork. 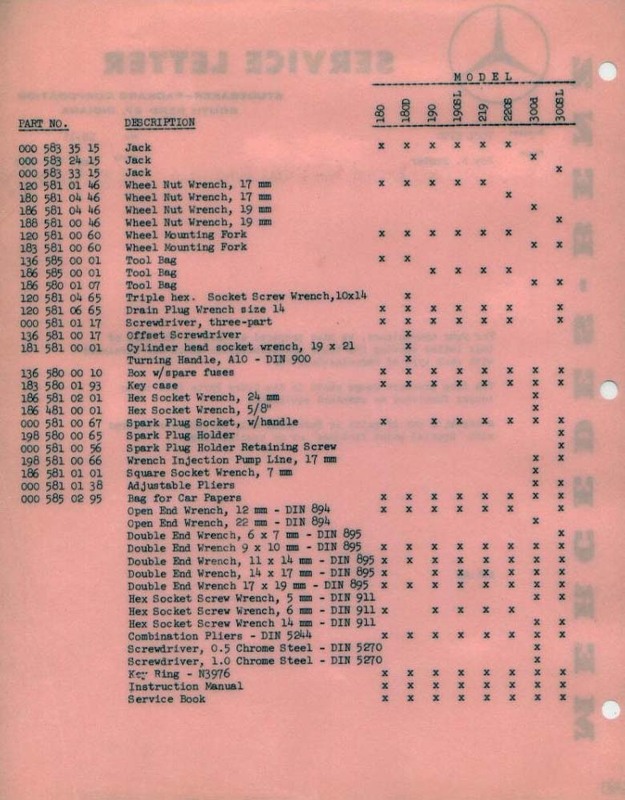 The chart provided in the Service Letter lists the tool as being part of all models in the Ponton range, yet not all spare parts catalogue illustrations (that have been provided in the creation of this web page thus far) include that particular tool. 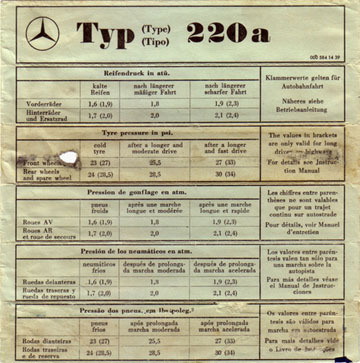 One spare parts list illustration (see below) which does include the U-shaped wheel mounting fork is from the Type 190SL roadster. 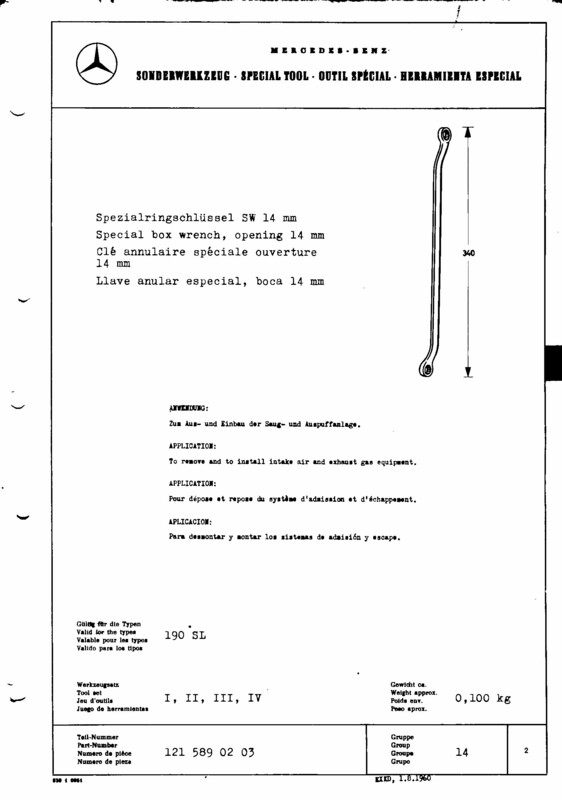 The publication dates of the parts catalogue illustrations may be significant as to the corroboration of the Studebaker-Packard document, which is dated December 12, 1957. 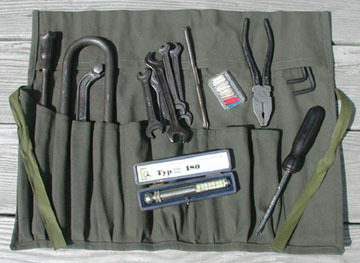 Unfortunately, in the case of the Type 190SL tool kit illustration (see below), no publication date was provided. 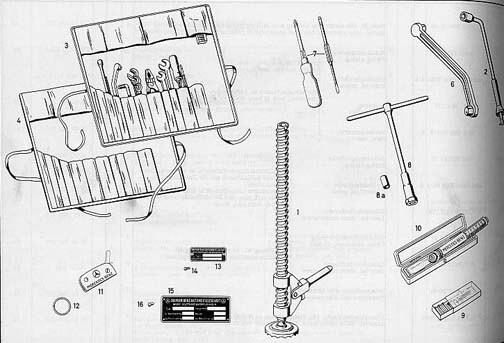 Other tool kit illustrations on this page are dated for comparison with the Studebaker-Packard Service Letter. 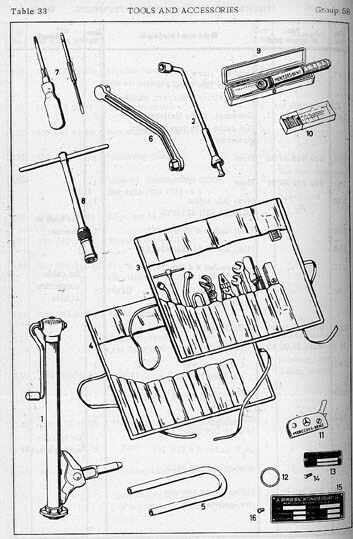 Note the differences between the early (May, 1956) versus the later (July, 1959) tool kit illustrations for the Type 190 sedan, below. 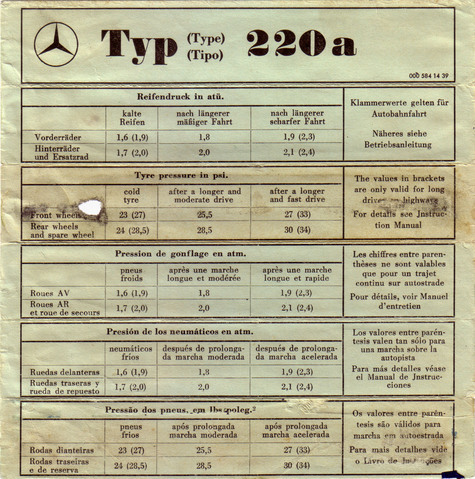 All models in the Ponton range used a 12 mm wheel lug nut (17 mm wheel nut wrench size) while the Type 300SL roadster-cabriolet, Type W136 170S-V sedan (7/1953-2/1955) and Type 300 "Adenauer" sedans of the era used a larger 14 mm wheel lug nut and wheel lugs (19 mm wheel nut wrench size). These cars also had a larger diameter U-shaped wheel mounting fork in their tool kits. Besides helping to align and install the wheel, the fork also protected the threads of the lug from damage during tire removal and installation. 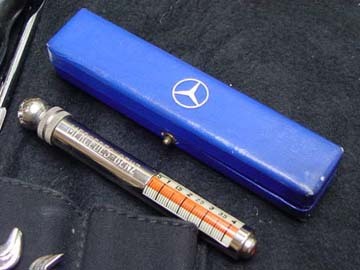 Tire pressure gauge (0.5 - 4.0 atü) from Ponton era tool kit (Type 300SL). Note the color of the box. It is a lighter blue than the other boxes of this era. 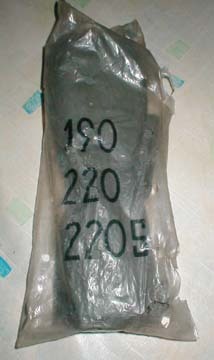 Mercedes-Benz part number 121 589 02 03. Special tool designed for 14 mm manifold nuts on Type W121 190SL. The first group of numbers (121) identifies the tool "originated" with the 121 chassis or engine, but that does not limit the part or tool to that specific car. 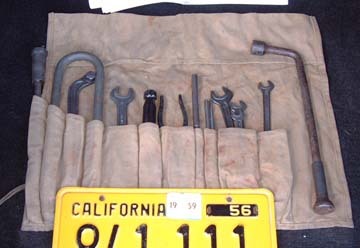 The second group of numbers (589) signifies parts group 58, which is "tools and accessories." 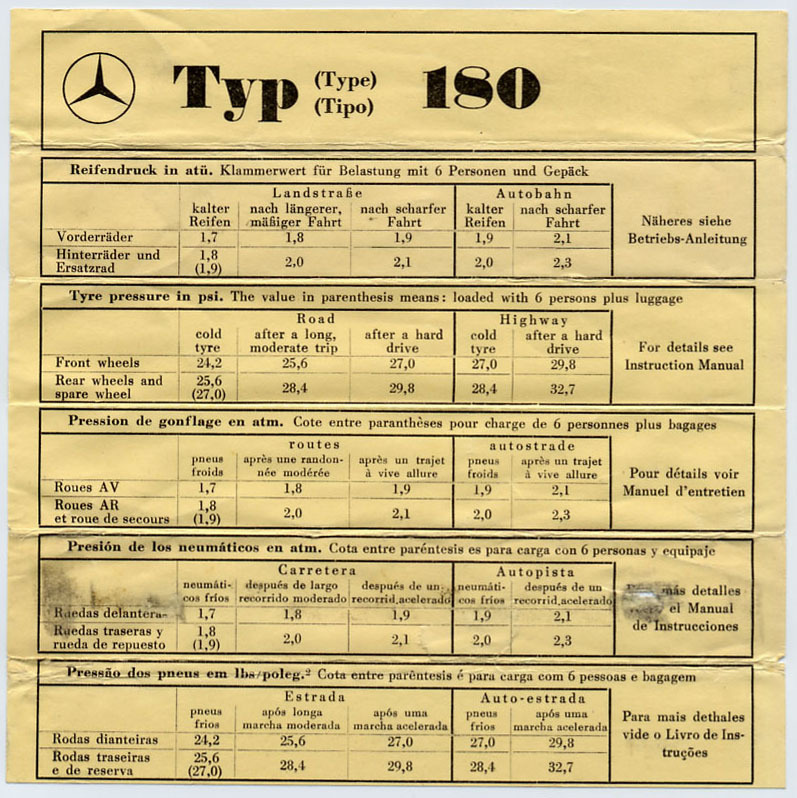 This illustration (Table 43, Group 58) is from a Type 300 Adenauer limousine spare parts list. Item 18 (spark plug wrench) has a spring at the end. 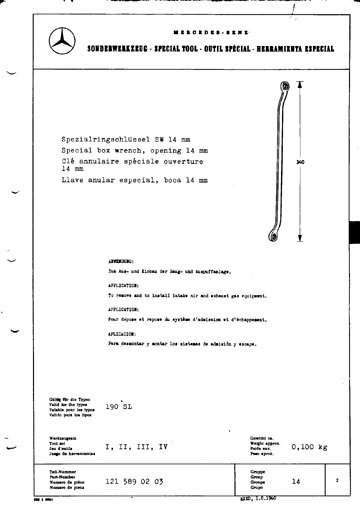 Item 13 (long-handle pliers) is not shown in other Ponton-era kits, but is described in the Service Letter as "Adjustable Pliers" (000 581 01 38). 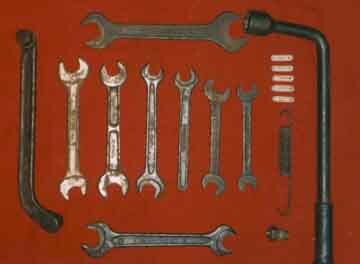 Items 11 and 12 are socket wrenches; special tools for the Type 300 only – used to service the generator and water pump assembly. 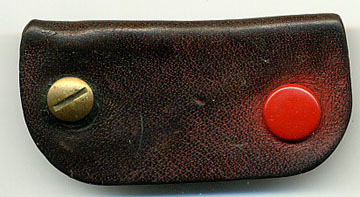 Finally, Item 24 – the pouch (186 580 01 07) was not canvas, but leather (usually red) as was the "Bag for car Papers" (a.k.a. 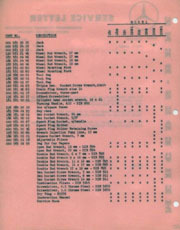 documents pouch) (000 585 02 95) also provided with the Type 300 limousines. 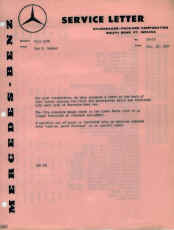 The service letter proclaims that the tire pressure gauge was no longer furnished as standard equipment as of December 12, 1957. Here is a link to the Type 300 Adenauer tool kit. 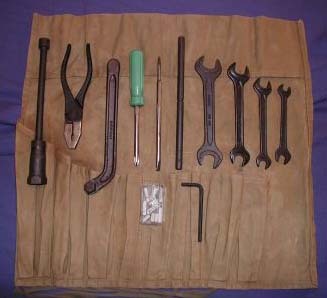 Mercedes-Benz Ponton tool kit. The green screw driver handle is unusual (not original). The hex (Allen) wrench is 6 mm. 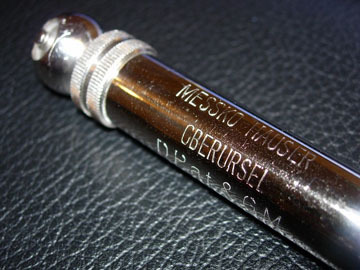 The small box contains spare fuses. 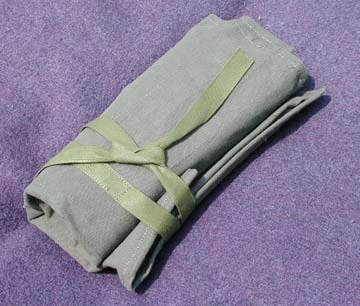 There are two different common colors for the canvas pouch: beige, and olive drab. Here, the beige pouch appears to be in good condition. 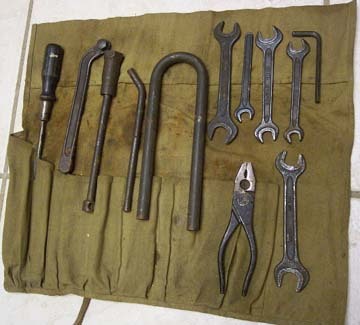 Most original Ponton era tools (with possible exceptions depending on which market the vehicles were sold in) were black anodized, not silver plated. 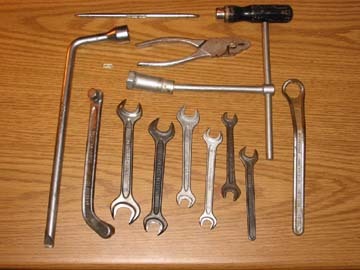 The silver plated tools were introduced later. 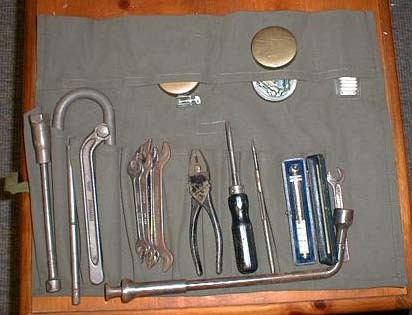 Detail of same tool kit. The screw driver handle appears to be plastic, and thus from a later kit. The original, wood screw driver handles are hard to find in good condition. 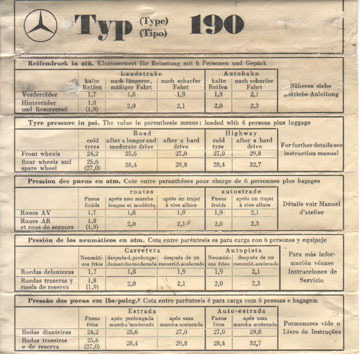 The illustration above is from the Mercedes-Benz Type 190 Spare Parts List, Edition A, dated May, 1956. Note it includes the U-shaped wheel mounting fork. 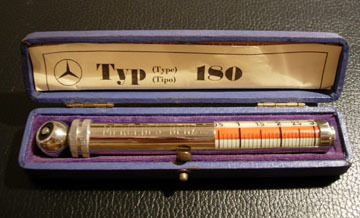 Compare this to the illustration below for the Type 190b dated July, 1959. 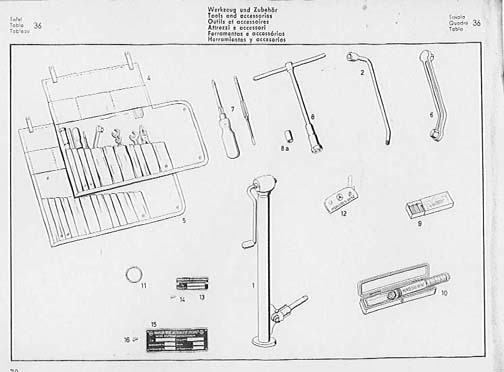 Illustration of Type 190b sedan tool kit and accessories as per spare parts list dated July, 1959. Note that the U-shaped wheel mounting fork is not shown in this illustration. 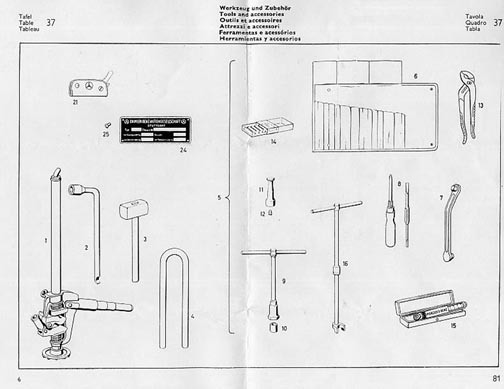 The Service Letter (above) from the Studebaker-Packard Corporation (dated: December 12, 1957) lists the U-shaped wheel mounting fork as part of the Type 190 tool kit. The wheel mounting fork must have been phased out with the introduction of the Type 190b (6/1959). Also note the service letter from Studebaker-Packard proclaims the tire pressure gauge was no longer furnished as standard equipment as of December 12, 1957, yet this illustration from July, 1959 still includes it. 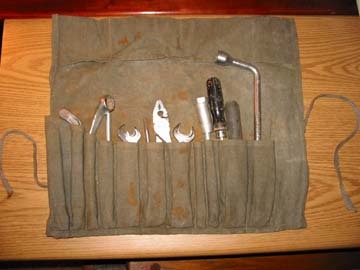 An original, unopened tool kit for the Type "190/220/220S." Since the bag is unopened, we do not know if the tools are black anodized or silver plated. If they are silver, this kit may be from the post-Ponton (Heckflosse) series, which would include the Type W110 190c, W111 220b and W111 220Sb. 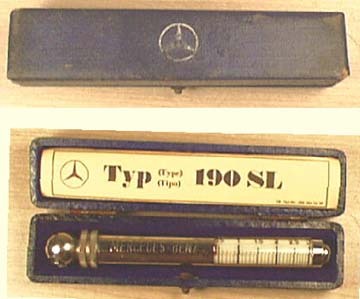 The tire gauge shown in this tool kit was originally from a 1958 300SL roadster, and the paper insert was for the Type 180 sedan. 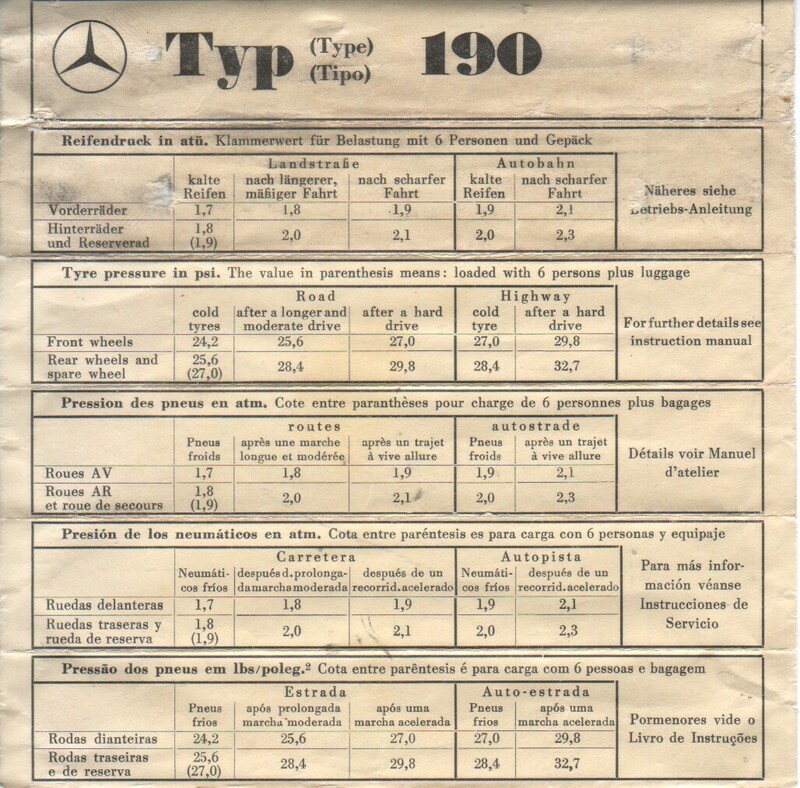 See elsewhere on this page for a printable Type 190 paper insert. 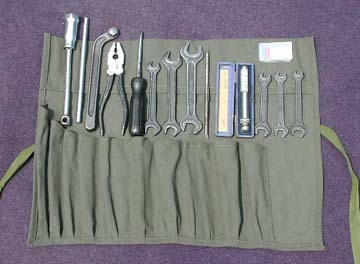 This updated photo includes the black anodized spark plug wrench (approximate length: 208 mm / 8.2 inches) and handle (approx. length: 200 mm / 7.9 inches). Also note the U-shaped wheel mounting fork and 6 mm hex (Allen) socket screw wrench. Close-up of "box with spare fuses" (DB# 136 580 00 10) / (6) 8A, (2) 16A, and (1) 25A — still available (new) from authorized Mercedes-Benz agents. 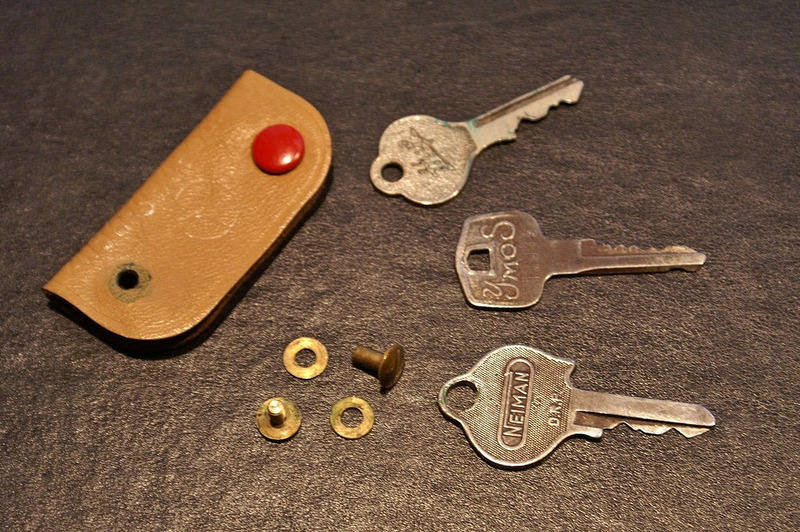 This Mercedes-Benz leather key fob came from a 1960 Type 190b Ponton sedan and is authentic for Ponton series cars. The owner bought the car new, and this was the original fob. 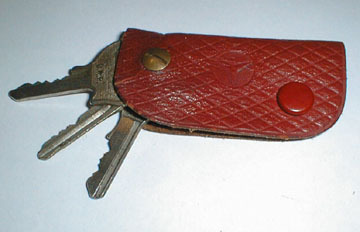 In 1964, the Heckflosse series cars also included a plain leather fob similar to this one. 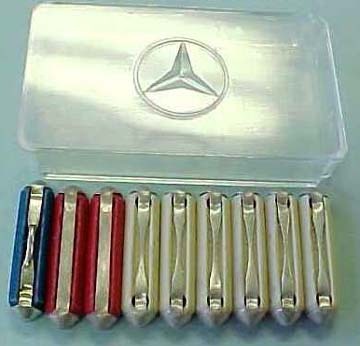 Note the tool kit illustrations for the 190, 190b, 220SE, 190SL, 300SL roadster, and 300 Adenauer limousine include a key fob that has the three-pointed star, so both style fobs appear to have been available at the same time. 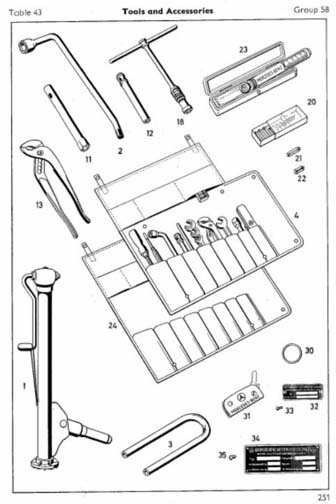 Here is the tool kit illustration that came with the 1958 Type 300SL roadster-cabriolet (8/1957-2/1963). Note the shape of the canvas pouch. It is different from other pouches in the Ponton line- up. 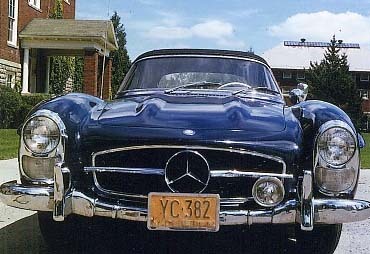 It resembles one of the Type 190SL pouches. 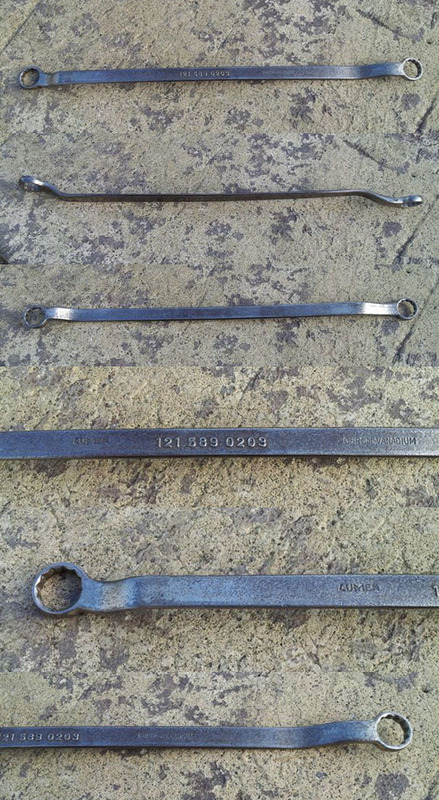 Note some automotive supply stores sell generic ("L" shaped) 14 mm hex (Allen) wrenches. 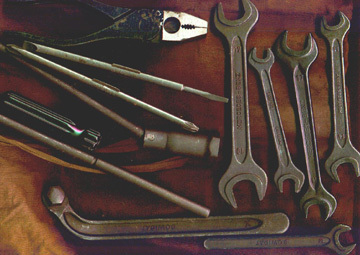 The profile of these "L" shaped wrenches may not work on the Ponton differential and transmission filler plugs because there is not enough space to get the wrench into position. 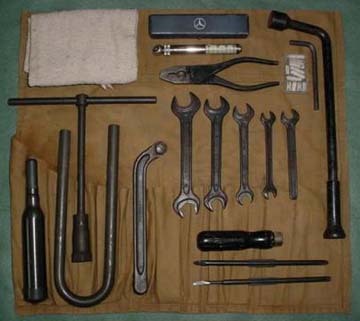 In that case, either the original Mercedes-Benz tool, or the modern combination wrenches (detailed below) will be needed. The contemporary Mercedes-Benz (Daimler AG) part number for the oil filter combination wrench is 000 589 24 07 00. As of June 2014, the tool was still available through the Mercedes-Benz Classic Center in California. 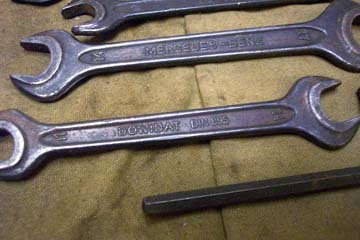 As of January 2006, the Stahlwille tool company sold a combination wrench that had the same profile as the original Mercedes-Benz wrench. It included a 14 mm male hex key at one end (for the oil, transmission, differential and gas tank plugs) and a 17 mm box wrench (used on the oil filter canister) at the other. The Stahlwille part number was listed on their website as either SF 3677 or 3677. The Hazet tool company also made a version of this tool under the part number 2760. 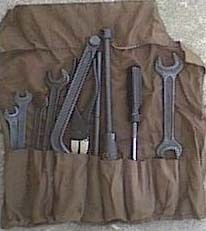 This tool is from a Type W120/W121 Ponton era diesel tool kit. Ponton era diesel models include: 180D/180Db/180Dc/190D/190Db. Described as a "single ring spanner" that fits the glow plugs. 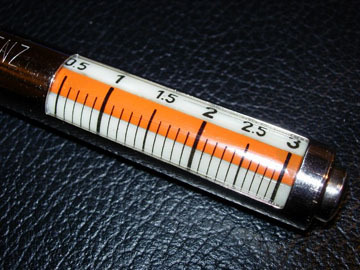 The size is 20.8 mm (13/16"). 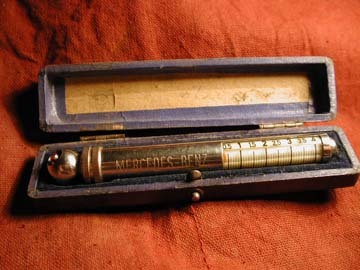 Markings include: "20.8 / Made in Germany / DOWIDAT / 000 581 18 36 / Mercedes-Benz".